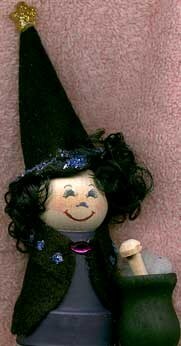 Let this little witch brew up a little Halloween mystery on a side shelf or small table. Paint candle cup black, inside and outside. Paint clay pot purple. Allow paints to dry. Cut pattern pieces from black felt. Fold the hat piece with straight edges together and glue the straight edges together at the seam to form a cone shape. Turn hat right side out to hide seam inside. Glue bottom of cone to centre of hat brim piece to complete the hat. Glue pony bead star to the top of the cone. Apply tacky glue to the hat brim edge and at dots indicated on jacket pattern. Sprinkle purple glitter over glue, allow to set and shake off excess. Glue wood doll head to clay pot bottom. Glue black doll hair to top of wood doll head. Glue hat on top of head/hair. Fold jacket piece collar as indicated on pattern and glue to clay pot as shown. Glue rhinestone to the center top of jacket. Study the face diagram at right; use coloured pencils to draw in the eyes, nose, mouth, and eyebrows then colour cheeks lightly with red pencil.